The Department of Philosophy offers a program of study leading to a doctorate degree in philosophy. Program requirements and other relevant information are explained below. All doctoral students should read and be familiar with these requirements. 45 units of graduate-level coursework (15 semester courses) are required for the PhD. At least 36 units will be allotted to the student’s 'major field' (philosophy) and the remainder to the student’s 'minor field' (either philosophy or an outside minor). If the minor is within philosophy, 9 units of coursework are required. If the minor is outside philosophy (for example, in cognitive science, linguistics, classics, or economics), the number of units is fixed by that program. In addition to coursework units, a student needs 18 units of dissertation credit, which are earned in writing the dissertation. There are also minimal residence requirements explained in the Graduate Catalog's Policies & Procedures, https://grad.arizona.edu/policies. There is also a formal requirement, which is met by completing a course deemed by the Director of Graduate Studies (DGS) to have sufficient formal content to ensure the student's ability to pursue an advanced degree in philosophy. A single course can be counted toward at most one distrubiton requirement, with the exception of the course that satisfies the formal requirement. The course that satisfies the formal requirement may, in some circumstances, also satisfy one of the other distribution requirements. At the end of this document is a list of courses that may be taken for each distribution requirement. These are guidelines rather than strict rules. The final decision about whether a given course counts for a requirement is up to the faculty. Unstarred courses under a given heading will usually count toward the requirement in question. Starred courses will sometimes count toward the requirement in question, depending on how the course is taught. Courses not on these lists might also count toward the relevant requirements, depending on their content. The decision of whether a given offering of a course satisfies a given distribution requirement will usually be made by the DGS, in consultation with the instructor of the course and with faculty members in the relevant fields. One faculty member in each area is designated as a consultant to whom students can direct questions and with whom the DGS may consult. See the end of this document for the current consultants. Of the 36 units of coursework required for the major, at least 18 units (6 courses) must be taken in seminars. If a student also minors in philosophy, an additional 3 units (1 course) of seminar work are required. Students transferring from other institutions may be given up to 12 units in transfer credit toward the course requirements in philosophy, at the discretion of the DGS. Students should establish eligibility of transfer coursework using the Transfer Credit Form in GradPath (on the UAccess Student Center page), which is due before the end of the first year in residence. A decision about this matter will not usually be made until the end of the student's first year in the program. At most one transferred course may count toward each of the distribution requirements, except in special circumstances. It should be noted that transfer credit is not automatic. Students should generally expect to transfer fewer than half of their courses from a previous institution, and sometimes none. Students should complete Doctoral Plans of Study (in GradPath) of their coursework during their first year in residence, to be filed no later than their third semester in residence. This form must be approved by the student's major and minor advisors and the DGS, and it must be submitted to the Graduate College. Distribution requirements should be completed by the end of a student’s sixth semester in residence. The logic competence requirement should be completed by the end of the student's fourth semester. Graduate courses in philosophy are divided into graduate seminars and graduate survey courses. Graduate seminars are numbered Philosophy 596A, 596B, and so on. Their enrollment is restricted to graduate students (in philosophy and possibly other departments), with occasional exceptions at the discretion of the instructor. Graduate survey courses are numbered Philosophy 5xx. These courses are usually offered simultaneously with an undergraduate course Philosophy 4xx, with common meetings. In many such courses, graduate students will meet separately (i.e., without the undergraduates enrolled in the corresponding 4xx course) every week or two. Seminars usually meet once a week for 150 minutes (Monday-Thursday) at 3:30 pm or later. Survey courses usually meet in the morning or in the afternoon before 3 pm, and have two 75-minute meetings or three 50-minute meetings a week, in addition to a possible graduate meeting. In general, survey courses offer a broad exploration of an area of philosophy and include a greater emphasis on instruction from the professor, while seminars are more specialized and include a greater emphasis on discussion and student presentations. However, seminars may sometimes also serve as broad explorations, and professors are encouraged to devote at least some portion of their seminars to more basic issues in a field before proceeding to specialized material. Students may also occasionally take an independent study course with a faculty member for 1-3 units. This will typically involve focused reading in an area of interest, a number of meetings, and a pre-arranged amount of written work. In a given course, students will usually be assessed on some combination of participation, presentations, and written work. A final grade of A, B, C, D, or E will be assigned by the instructor and submitted to the Graduate College. All Philosophy PhD students taking a graduate course will also receive internal grades (on a scale including +'s and -'s) along with a paragraph or so of the professor's comments on their performance in that course, both of which will be placed in the students' files for them to consult. Grading practices vary between faculty members, but generally speaking, a grade of A indicates very good work, while a grade of B indicates work that is less than fully satisfactory in some significant respect. Grades below B are rare. Each course's policy on taking an Incomplete (I) wil be described in the syllabus. In addition to the particular policies on Incompletes specific to each course, the university policy will also apply in all cases. The university policy automatically converts an I to an external grade of E if no petition for a grade change from I to a letter grade has been approved by the appropriate university authorities within a calendar year from the date on which a grade for the course in question was originally due. Students will usually take three courses per semester, and occasionally four courses (especially when on a fellowship). The Graduate College requires that all students who are teaching assistants, research assistants, or on fellowship be enrolled in at least six units per semester. Students in the first two years of the program will typically take at least six courses a year. In their fourth semester, students may enroll in an independent study course (instead of a regular graduate course) focusing on preparation for the qualifying requirements (explained below). Guidance on progress toward the PhD will be given to students early in the program, and certainly before completing all coursework. This includes the strong recommendation that students seek out potential dissertation committee members before the end of the Fall semester of the second year in the program: these may or may not also be members of the students' qualifying committees. Students are also advised to begin thinking about their dissertation topics early in the program, in consultation with potential dissertation committee members as well as other department members and fellow students. 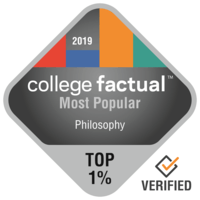 The Philosophy Department regards a minimally satisfactory first year GPA as one that exceeds 3.5. For more advanced students, normal progress requires a GPA well in excess of 3.5. The Graduate College requires a minimum grade-point average of 3.0 (based on the official grades submitted to the Office of the Registrar). Toward the end of every academic year, the faculty conducts a review of graduate student progress. The progress of each graduate student is discussed, and areas of success and concern are identified. After the annual review meeting, the DGS will write a memo to those students whose progress was discussed (typically, but not exclusively, those in the early years of the program), summarizing the discussion. This memo is sent to the student and placed in the student’s file. When a student's progress is deemed unsatisfactory, the student will receive a written notification of that fact. Subsequent to the written warning, and after the student has been given adequate time to improve his or her performance, the faculty may vote to request that the Graduate College remove the student from the philosophy graduate program. The student may appeal this request for removal in writing within 15 working days of notification. The student should provide a written rationale for the appeal, along with supporting documentation, to the Department Head. The Department Head will then convene a committee consisting of the members of the Executive Committee and the DGS to review the student's case and notifying the student of its final decision within 15 working days of receipt of the request for appeal. Students who have not yet passed the comprehensive examination (see below) should meet with the DGSt least once a year to discuss their progress and their plans. Students should also feel free to meet with the DGS at any time to discuss issues that may have arise, to ask for advice, and so on. Students have the right to view their files, with the exception of confidential material, and may do so at any time by asking the Graduate Coordinator. Students are encouraged to review their files periodically. Students will choose between two ways of qualifying for advanced standing in the program: either by taking a qualifying examination intended to demonstrate breadth of knowledge in a primary and secondary area of specialization, or by writing a substantial, original qualifying paper. A student must inform the Graduate Coordinator which qualifying option they have chosen by the end of the Fall semester of the second year of the program, together with the names of the chair and the other members who have agreed to serve on the qualifying committee. In preparation for the qualifying requirement, students may take a 3-unit independent study course with the chair of the qualifying committee in the second semester of their second year in the program. Students are permitted - indeed, encouraged - to qualify prior to completing all coursework, though all coursework must be completed before attempting the Comprehensive Examination. Once the Qualifying Requirement is passed, the exam or paper will be added to the student's file with a note from the committee chair indicating whether or not the student has passed. The committee for a qualifying exam will consist of four professors, typically two in the major area and two in the minor area. At least three of these professors will be in the Philosophy Department unless a special allowance has been made. For most areas reading lists are available online (accessible with NetID and password) or from the DGS. The available reading list for an area contains ‘core’ readings in that area, and is meant to constitute roughly 80-85% of that area’s total readings in preparation for the corresponding exam. The remaining 15-20% is to be selected by the student in consultation with exam committee members, and is intended to allow students to tailor a portion of the reading list to their particular interests in the area. The qualifying exam in the primary and secondary areas will cover the readings that constitute the final reading lists for each area. A core reading list may be updated on a yearly basis early in the Fall semester under the direction of the DGS and in consultation with faculty members representing an area. Normally, students who enter the program in a particular year will go by the reading lists that are available in their third semester, and they are encouraged to consult the relevant lists early in their graduate careers. Students wishing to be examined in an area for which a fixed core reading list is not yet available will coordinate with relevant faculty in order to develop a reading list. The committee members in each area will prepare a written exam on the material covered in the reading list. The written exam in the primary area will typically be a 4-hour exam consisting of three or four essay questions drawn from a range of choices. The written exam in the secondary area will typically be a 3-hour exam consisting of two or three essay questions drawn from a range of choices. These exams will be assessed by the committee members in the relevant area. If the committee members in each area deem that the student’s performance on the written exam is appropriate for an oral exam to proceed, then an oral exam will be held, with all committee members. The oral exam will last two or three hours and will cover the material on the reading lists, with attention both to the student’s answers on the written exams and to other topics from the readings. After the oral exam, the committee members will vote on whether or not the student has passed the qualifying examination as a whole. Timing of Exam Option: Written component of the qualifying exam: students will take the written component during the week immediately prior to the start of the Fall semester of their third year in the program. Oral component of the qualifying exam: students will take the oral component during afternoons of the first week of the Fall semester of the third year in the program, faculty availability permitting. Otherwise, oral exams will be scheduled as soon after the first week as feasible. To fulfill the paper option of the qualifying requirement, a student must write a substantial, original paper approaching professional quality. The committee for the qualifying paper will consist of three faculty, at least two of whom (including the chair) must be tenure-track members of the Philosophy Department. After reading the final version of the paper, the committee will vote on whether the student has qualified. A pass requires at least two positive votes. The tally will be communicated to the student. Timing of the paper option: Students choosing the qualifying paper option will submit a substantially completed draft no later than April 15 of their second year in the program. The chair of the qualifying committee will provide comments on that draft, and forward other committee members' comments, no later than the last day of finals. The student will submit a final draft no later than August 1. Further procedures concerning Qualifying Requirement: For departmental procedures concerning failure to complete the qualifying requirements according to the timeframes explained above, click here. To become candidates for the doctorate, students must pass the comprehensive examination, which has written and oral components in the major and minor fields (minors other than philosophy may not require a written examination). The comprehensive exam is to be attempted before the end of the Fall semester of the student's fourth year in the program. Students are strongly encouraged to attempt the comprehensive exam before the start of the Fall semester of their fourth year in the program in order to be eligible for external dissertation fellowships. For the written portion of the comprehensive examination in philosophy, the student must submit a prospectus of the dissertation, together with a substantial essay which will typically constitute the draft of a chapter of the dissertation. The oral portion of the examination will usually start with a brief presentation by the student, followed by questions and comments from committee members that not only cover the written work but also assess whether the student has the breadth of knowledge and philosophical skills required to undertake the dissertation project proposed. The oral examination will take from one to three hours. The student will use the Announcement of Doctoral Comprehensive Exam (in GradPath) to schedule the exam at least 7 days in advance, and generate the Results of Comprehensive Examination Form for the committee chair to submit. If there are two or more negative votes, the student will not pass. In such a case, the committee may permit the student to repeat the examination or it may determine that the examination not be repeated, with this latter decision resulting in the termination of the student's eligibility for the degree and the student's removal from the program at the end of the current semester. After passing the comprehensive examination and finishing coursework, the student should submit a Doctoral Dissertation Committee Appointment Form (in GradPath) to verify that requirements are met. Please consult the Graduate College Dissertation Committee Page. The committee head will act as the student's main advisor. This committee will often, but not always, have the same members as the major comprehensive examination committee. The student will usually show dissertation material to committee members as it is produced, and consult regularly with committee members on how to proceed with, and improve, the dissertation. Once the student produces a complete draft, it will be submitted to committee members, often leading to a process of revision. Traditionally, a dissertation takes the form of a monograph. Under some circumstances, and subject to the advice and approval of the graduate student’s dissertation committee, an acceptable dissertation can take the form of a set of at least three thematically related papers. The substance and length of the papers (combined) should be comparable to a monograph dissertation. Except in unusual cases, the qualifying paper will not count among the papers in the minimal set of three. In contemplating both the form and the substance of their dissertations, graduate students should be forward-looking. The object is to develop an original and fruitful research program that will extend beyond their tenure as graduate students. Once committee members deem the dissertation appropriate for examination, an oral examination (dissertation defense) will be held. The oral examination will typically start with a brief presentation by the candidate, followed by questions from committee members.. At the end of the examination, the committee will choose one of three options: pass, pass pending revisions, or fail. In conformity with the policy of the Graduate College, the student presentation component of the doctoral oral examination (but only this component) is open to the public. In line with this policy, the Philosophy Department permits, at the discretion of the examined student and the examining committee, the advertisement of the student's oral examination in venues beyond those required by the Graduate College. Timing: A complete draft of the dissertation should be submitted by the end of the student's ninth semester in the program. The oral examination should take place during the tenth semester. The student should submit an Announcement of Final Oral Defense (in GradPath) to the Graduate College at least 7 working days before the date of the examination. Students who do not pass the oral examination within four semesters of completing the comprehensive examination may, on the recommendation of the dissertation committee and by vote of the department, lose their status as degree seeking students, in which case they would need to re-apply as non-degree seeking students. All requirements for the PhD in philosophy must be completed within 5 years of passing the comprehensive exam. Should students not finish within that time, they may be allowed to re-take the comprehensive exam with permission of the faculty and then proceed to complete other requirements (e.g., the dissertation). Under special circumstances, and with a letter of justification from his or her advisor, a student may petition for an extension. The requirements listed here recapitulate some of the Graduate College requirements, and supplement them on occasion, but they do not replace those requirements, and there are Graduate College requirements that are not mentioned here. For further details on those requirements, see Graduate Catalog Policies and Procedures. 1. Responsible Conduct of Research confirmation form (in GradPath in the dropdown box next to your schedule on your UAccess Student Center page). The Announcement of Doctoral Comprehensive Exam form (GradPath) triggers the Results of the Comprehensive Exam form for the committee chair to submit. Graduate students in philosophy may earn a master’s degree on the way to the PhD, so long as they have not already earned a Philosophy MA at another institution. To earn the MA, a student must complete 30 units of graduate coursework in philosophy (10 courses). The student must pass (with a grade average of 3.0 or better) at least one graduate course in each of the following four areas:  Metaphysics or Epistemology,  Ethics, Political Philosophy, or Value Theory,  History of Philosophy, and  Philosophy of Language, Philosophy of Science (includes Cognitive Science), Philosophy of Mathematics or Logic. Students admitted to the program are usually guaranteed five years of funding, contingent on satisfactory academic progress and barring unusual financial exigencies. In most semesters, this funding takes the form of a Graduate Teaching Assistantship (GTA). Occasionally the funding may take the form of a Graduate Research Assistantship or fellowship. Out-of-state fees are waived for students with GTAs and, contingent upon funding, in-state registration fees are also waived for GTAs. GTAs are required by the Graduate College to have an official GPA of at least 3.0. Failure to maintain at least an official 3.0 GPA may result in a loss of funding. This means that it is vital to avoid grades of E that result from failure to complete coursework in a timely manner. A student with a GTA will most often act as a teaching assistant in a course taught by a faculty member. This will usually involve teaching up to three one-hour discussion sections per week (with about 30 students each), grading papers and examinations, and other duties. It may sometimes involve grading but no direct teaching. There are some opportunities for a GTA to teach a course independently. In this case, the GTA is usually responsible for designing a syllabus (which must be approved by a faculty member), lecturing, designing paper topics and examinations, and grading papers and examinations. There are also some opportunities for additional independent teaching during the summer and winter sessions. GTAs teaching independently will consult with a faculty member. In the Fall semester of the first year, before classes begin, graduate students must attend a University-wide training session that acquaints them with university resources and explores the basics of working as a GTA. In addition, graduate students are expected to complete the department’s teacher-training program in the first year. Sessions I-III are mandatory. Although Session IV is optional, it must be completed in order to be eligible to teach summer courses or any online courses during the academic year. Members of the GTA Advisory Committee visit each graduate student’s sections during their first two years of teaching and at least twice thereafter. Additional visits are made as seems advisable or as individual graduate students may request. Committee members are expected to provide detailed oral and written feedback, with the aim of identifying teaching strengths and weaknesses and offering specific suggestions for improvement. Graduate teaching assistants also receive teaching evaluations from the undergraduates enrolled in their sections. Students are encouraged to attend philosophical conferences, present their work at philosophical conferences, and submit their work to philosophical journals. These activities are valuable both for a student's philosophical development and for establishing a professional record in preparation for the job market. Conference attendance: Conferences are held quite regularly in Tucson: for example, there is a colloquium in Ancient Philosophy each February, a major conference on consciousness every second April, and occasional topical workshops. Students are encouraged to take part in these and other meetings. At the national level there are also three annual meetings of the American Philosophical Association, and many more specialized meetings. Conference presentation: Students are strongly encouraged to submit their work to APA meetings and other philosophical conferences. Students whose work is accepted for presentation at an out of town conference are eligible for a modest travel stipend from the department, contingent upon their application to the Graduate College for similar funding. Journal submission: Students are also strongly encouraged to submit their work to professional journals. Students should keep this in mind when writing papers for seminars and their qualifying paper. As a rough rule of thumb, students should expect to apply for jobs in a given year if their dissertation is at least half complete, and if they expect to complete it within the current academic year (or in the summer at the latest). Students who are job candidates will work closely with the Placement Director in compiling their application dossiers and preparing for interviews, and they are strongly advised to begin preparing for the job market starting in their first semester. An application will typically include a cover letter, CV, a writing sample, a number of letters of recommendation from faculty members, and materials related to teaching. Before the initial round of interviews, the UA Philosophy Department will conduct mock interviews and students will often give a practice talk. The Placement Director will travel to the APA to assist job candidates there. All students are expected to attend all department colloquia, which usually take place on Friday afternoons from 3:00 to 5:00 pm. The following is a list of courses that may be taken for each distribution requirement. These are guidelines rather than strict rules. The final decision about whether a given course counts for a requirement is up to the faculty. Unstarred courses under a given heading will usually count toward the requirement in question. Starred courses will sometimes count toward the requirement in question, depending on how the course is taught. Courses not on these lists might also count toward the relevant requirements, depending on their content. Consult with the DGS and with the area consultants to be sure. The area consultants are: Terry Horgan (M&E), Julia Annas (History), Mark Timmons (Ethics), Shaughan Lavine (Logic/Language/Science). To satisfy the formal requirement, students may also take any course of a formal nature at an advanced level offered by another department that is approved by the DGS and a faculty member in whose area the student is working, or any course in the Greek language approved by the DGS in consultation with a faculty member working in the area of ancient Greek philosophy. A philosophy minor for a graduate student from outside the philosophy department requires that the graduate student take three graduate courses in philosophy (9 units) in any area subject to the approval of the DGS. Transfer credits will not be accepted for the minor. A comprehensive examination is required in an area of philosophy chosen by the student with the approval of the DGS. The comprehensive exam would have both a written and an oral part. The student would have two faculty members on the comprehensive examination committee, each from the Philosophy Department. They would help the student draw up a reading list in the student’s desired field in philosophy. The written part would be a three hour exam taken by the student at a time of his or her choosing on the subject agreed upon with the members of the committee. The oral examination would consist in the two Philosophy Department committee members examining the student on the basis of the written answers, exam questions not answered by the student, or on other issues connected with the agreed upon reading list. The oral part of the exam may take place in conjunction with an oral exam in the major field if this should occur.